What is orthodontic headgear used for? What are the different types of orthodontic headgear? How much does orthodontic headgear cost? Is orthodontic headgear ever worn without braces? Can headgear be used to correct an underbite? How do you put headgear on? How long is orthodontic headgear worn? Is headgear for braces still common? If not, what are the alternatives? Who needs orthodontic headgear? Is it only indicated for children or is it also for adults? Does orthodontic headgear hurt? Are there any side effects? How do you clean orthodontic headgear? While braces are an effective way to realign the teeth, alternative means are sometimes required. Orthodontic headgear can be used to correct an overbite or underbite, and is usually prescribed to growing children. Slight discomfort is normal and side effects are rare. Orthodontic headgear refers to an appliance that creates the necessary force to adjust teeth to their proper position and guide the growth of the face and jaws. Today, orthodontic headgear is recommended less frequently than it was in the past. But this doesn’t mean that it’s never used. Should you or your child need headgear, your orthodontist will recommend a specific appliance, design a customized treatment plan for you, and provide you with instructions for use and care. We spoke with two experts — Miami orthodontist Alicia Carroll, DDS and Denver orthodontist Robert Rudman, DDS, MS — to learn more about orthodontic headgear. Below are their answers to the questions orthodontic patients (and their parents) often ask about these dental appliances. “In a growing individual, headgear is used to correct a skeletal imbalance if the upper or lower jaw is too far forward,” says Rudman. In conjunction with braces, orthodontic headgear can be used to shift the molars backwards while guiding jaw growth in particular direction. “A headgear appliance is made up of three parts: bands, a facebow, and a strap,” says Carroll. Headgear should be worn consistently for at least 10–12 hours per day (including nighttime) for optimal results. Left: full orthodontic headgear with headcap, fitting straps, facebow and elastics. Top right: reverse-pull headgear with straps hooks for connection of elastic bands into the patients mouth. Bottom right: reverse-pull headgear face-mask. In other words, it is the extent of work being done that may be costly, not the headgear itself. “Some orthodontists will prescribe headgear without braces to correct the jaw discrepancy early—before braces are placed,” says Rudman. Yes. “A reverse pull headgear can be used early in a growing patient to correct an underbite, depending on the severity of the jaw discrepancy,” says Rudman. “It is fitted by the orthodontist so the patient can insert it into small attachments on the molars. 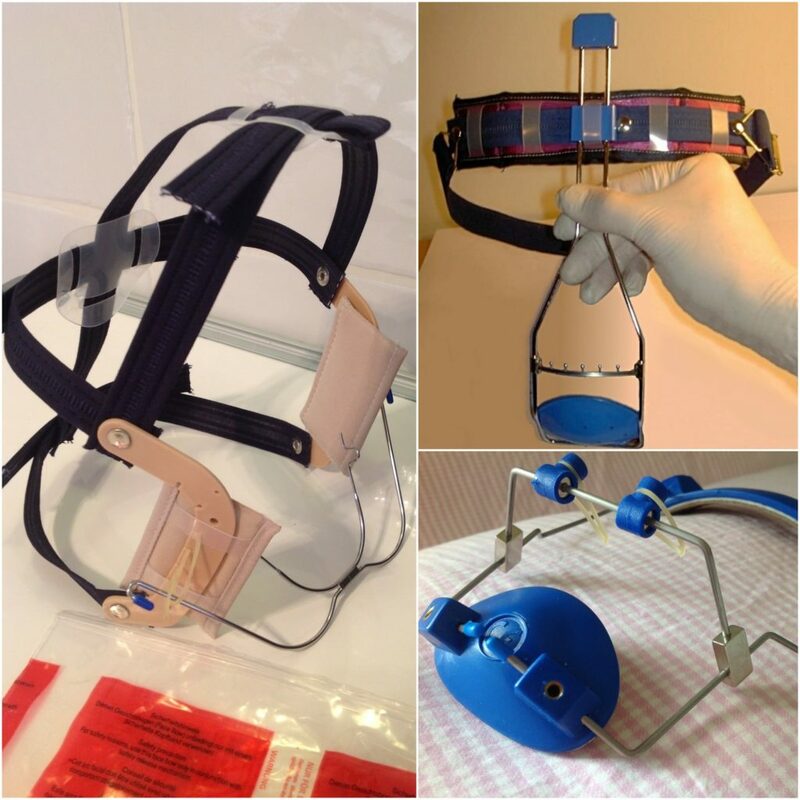 The patient can then easily place the headgear on their own,” says Rudman. Orthodontic headgear is not used as often as it was in the past. “Headgear is rarely used in the modern orthodontic practice,” says Rudman. “Usually it is only used in a growing patient, so it would be prescribed for a child,” says Rudman. Carroll agrees for the most part. While headgear can help correct both the incorrect position of teeth and jaws, it is most commonly worn during Phase I (early) treatment by children with a jaw growth discrepancy. Children in the 13–18 age group may require special consideration, as some jaws may still be growing in this period while others may have already stopped. There is also gender variation—girls typically stop growing at a younger age than boys do. The orthodontist may ask for a cephalometric X-ray to inspect the vertebrae. This shows if the patient is still growing (headgear can then be used); if the patient has stopped growing, orthodontic headgear will not be useful. An older method used by some orthodontists is to request an X-ray of the patient’s fingers to determine if the patient is still in the growth period. Some minor discomfort is normal as new patients adjust to wearing orthodontic headgear. “Some soreness is normal for the first few nights, but if the headgear is worn as instructed, this soreness goes away,” says Carroll. If you or your child do experience discomfort, your orthodontic specialist will likely recommend an over-the-counter pain reliever, such as ibuprofen, and may recommend a diet consisting of softer foods during the adjustment period. Moving forward, your teeth may feel slightly sore when chewing, and there may be slight mobility in the molars. This is normal—in fact, it usually means the headgear is working properly. Actual side effects from headgear are rare. “If the headgear is fitted and adjusted properly, there will be no side effects,” says Rudman. These may be signs of a problem. Contact your orthodontist immediately if any of these occur. Orthodontists have varying instructions for cleaning orthodontic headgear. To keep your headgear working properly—and for the sake of your oral health and overall health—it is very important that you follow these instructions closely. One of the instructions Rudman emphasizes to his patients involves brushing. “A headgear is made of stainless steel, so brushing the part of the headgear that is inside the mouth on a regular basis with a toothbrush is a great idea,” he says. If you did not receive instructions for cleaning and other care, contact your orthodontist. Your orthodontist’s instructions should cover more than just cleaning. It is crucial that you follow all of the instructions. For example, if your child neglects to wear the headgear during the hours outlined by your orthodontist, your child will need to make up for it the next day. Failure to wear the headgear for one day risks reversing all of the alignment progress made over the previous week. It is also very important that the headgear be put on and removed in a safe manner, and as instructed. If you have any additional questions about orthodontic problems, contact your orthodontist to set an appointment. If you don’t yet have an orthodontist, your family dentist should be able to refer you to a qualified provider in your area.